Most people seem to hate friendly Heavies. You know, those Heavies who wander around maps, Sandvich in hand, not actually doing any killing. Free points if they’re on the enemy team, a waste of a slot if they’re on yours. But when everyone on a server is being a friendly Heavy, that means they can be easily swayed by your will. And your voice, particularly if you have one of those deep, gentlemannly, British voices or happen to be obviously female. But now we have a server full of willing players under our command, what can we do with them? Play games with them, of course! Before I continue, I must point out that there’s lots of custom game modes based on minigames, particularly the Wario Ware mod, which involves custom maps and all sorts. But that’s a mod. I’m talking about spontaneous stuff. The sort of stuff you’d do with a friendly admin. Maybe try these out on a server full of friends? Anyway, onto our list of mini-games! Class rushes are simple. Everyone switches to one class and everyone goes on a killing spree. There’s no real point to this game (is there a point to any of them?) but it’s always amusing to see a swarm of SMG Snipers pushing a cart. It’s not quite as amusing though when someone decides to go Pyro during a Spy Rush, so make sure you inform all server new-comers whenever you switch classes. Similar to Heavy Picnics, Engy Dance Offs involve nothing more than plonking dispensers on the ground and taunting your little Texan asses off. Quite often, this turns into a Taunt War after someone accidentally smacks someone else’s head in, forgetting that they had the Frontier Justice equipped. Dispensers also make for good walls for a Gunslinger Battle Arena. Accompanied by some good ol’ country music and you’ve got yourself a very happy server. 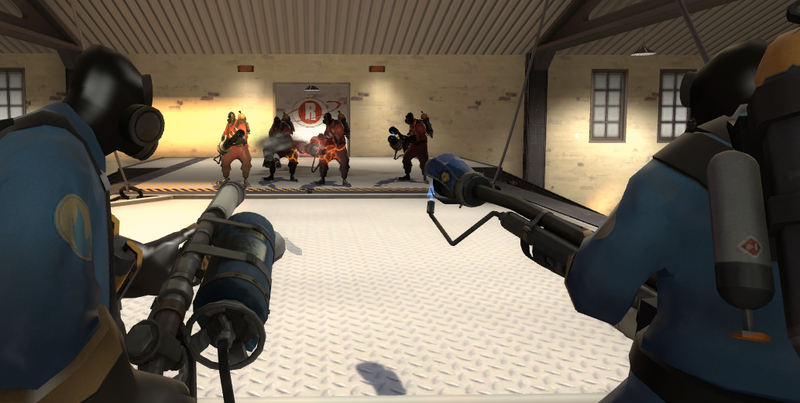 When there are a lot of Pyros around, invite them to kill you with airblast only. With a Soldier on each team and a tennis court of your choice, you may end up with reflected rockets breaking the sound barrier. Make things more amusing by using the Black Box to fire your rockets, getting a Medic to Kritz you or using weapons like the Huntsman and the Crusader’s Crossbow for an incredibly tricky game. Pyro Tennis is best played on maps with large spaces, particularly those Orange maps. Although this game works best with low gravity, it can also work well by getting everyone to use the Rocket Jumper. With two teams filled with Soldiers, chaos ensures as everyone tries to kill each other with the Righteous Bison. And the Cow Mangler 5k. Make it Melee Only for even more fun. Unless everyone hates Trolldiers. Best done on Payload or Capture the Flag maps, the chance to win a prize will always get people running around, whether they’re Scouts, Medics, Soldiers or Heavies. Common variations are GRU Heavy Races and Baby’s Face Blaster Scouts. My favourite was Cozy Camper Racing, but since the Move That Update Up update, this one no longer works. One of my personal favourites, Taunt Wars make for a silly alternative to Arena Mode. The rules? You’re only allowed to kill people using kill taunts. Of course, everyone will switch to Sniper and Pyro, but everyone will soon find out that the winners tend to be Heavies and Soldiers, with their wider area of effect. Watch out for Dead Ringer Spies, Fists of Steel Heavies and cowards who suicide the second they get caught by a Sniper. A game that has a risk of turning nasty if bets are involved, Spycrabbing is incredibly simple and relies on a chance of 1 in 10. When the Disguise Kit is the current weapon, taunting gives the player a 1/10 chance of doing the Spy Crab taunt. Made into a game with a row of Spies, the first person to do a Spy Crab taunt is out of the game. This continues until there’s only one player left. A variation of this is Thriller Taunting, which can be done with all classes during Halloween. A related game is the Spycrab Race (which also has a mod) where Spies walking in a certain pose race down a course while being hunted by Snipers. So, there we have it. A bunch of silly games to play with friends. While you probably won’t get to play these mini-games very often, it’s always nice to keep them in mind. And I’m sure you’ve all got loads of other games to share, right?